Its hard to believe we are in the middle of April! This year has gone by so fast, but what’s great is April usually comes with an influx of road races. What’s the saying ‘April showers bring May flowers’, well April also brings with it an abundance of events that inspire social connectedness and health. I love this time of year, shed those warm weather cloths, head out for a comfortable run where I’m not tight because of cold weather, but most importantly it stays light till after 8pm. Spring has always inspired me to set my next goal, which hasn’t happened lately since I started planning events, yet when I look back at my accomplishments and others it inspires me to do more. I have run in over 25 Half Marathons, 4 Half IronMan, countless 5ks and 10ks but I have only participated in one Full Marathon and it was painful. Of course it didn’t help that it was two weeks after a Half Ironman in Macon Georgia, but when I got connected to Charlie Gregory, by way of one of my BeltLine participants, I uncovered the fact that he had participated in 100 Marathons. I thought to myself – no way, that is crazy, not to mention all the training that goes into getting ready to run in something like that. I was beside myself and awed by his accomplishment, so I had to learn more. Charlie was born in 1934 making him 81 years old and he is still going strong, now tell me that’s not inspirational? 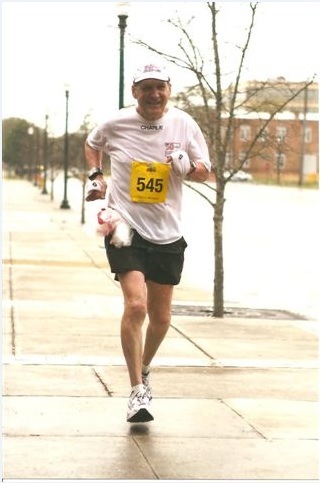 Charlie started running in 1984 at the age of 50 in preparation for the Peachtree Road Race. Personally I have only completed two Peachtree Road Races but I know of people that make it an annual event and some have been participating since the inception. So I asked Charlie how many times he participated, Charlies stated, ‘I’ve completed 30, I try to run several 10k’s a year but I ran my first half marathon in the early 90’s, starting with the Thanksgiving Day Half Marathon. I ran several Half Marathons after that with finishing times between 2 hours and 2 hours and 15 minutes.’ Charlie replied. So I asked Charlie what prompted him to start running Marathons. I mean people don’t just wake up one morning and say ‘Hey I want to run 26.2 miles in four or five hours today’. Charlie replied, ‘I kept getting information in my Peachtree Road Race Packet to do the Thanksgiving Day full marathon’. Good plug for new event organizers on how to market their first event! ‘So I decided to give it a try and in 1998 at age 64 I lined up on Thanksgiving Day and headed out not having ever run more than 13.1 miles. I finished my first marathon in a time of 4:44.’ Charlie stated. Charlie replied ‘I ran no more marathons until 2000 when I ended up running 5 marathons with a time in one of them of 4 hours and 22 minutes, which was my PR and the rest of the marathons I ran in less than 5 hours. I continued running with a goal of doing a marathon in all 50 states and I finished all 50 states in 2007 – 8 years later,’ Charlie replied. 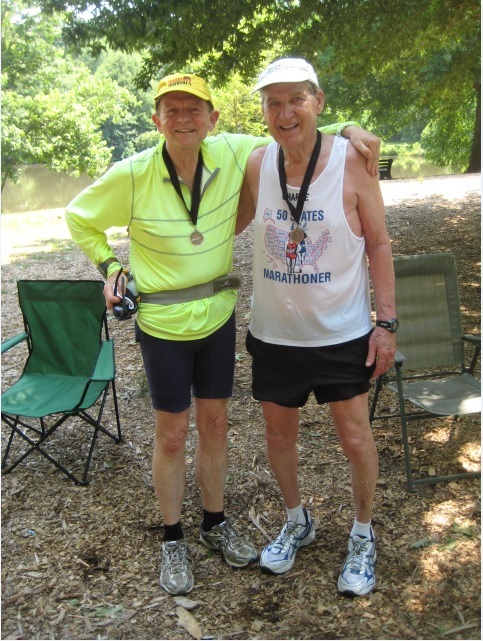 ‘I went on to finish my 100th marathon in 2013 at the Publix Ga Marathon in Atlanta’, Charlie stated, ‘Goal Completed!’ Personally I can’t imagine how it feels to check off that kind of accomplishment, way to go Charlie. So I asked Charlie about his support system and what I meant by that is did he have training partners and friends, as that much running requires an echo system, Charlie replied’ I belong to several run clubs from the Atlanta track Club, Darkside Running Club, 50 States Marathon Club, DC Marathon Group and 100 Marathon Club.’ So I would say Charlie is socially connected and has a great support system. Thank you Charlie for sharing your story, you are amazing and very much an inspiration to us all – keep running! Whether you are 10 years old or 60 its not too late to start..